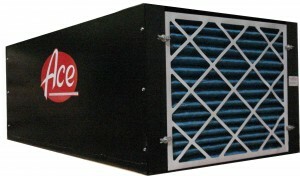 The Ace 74 Series Ambient Air Cleaner has been a popular product in the Ace assortment for years. They are an effective tool for general shop air cleaning, and while they are not a direct replacement for a source capture fume extractors, they are nevertheless an important supplement to a shop’s overall health and safety program. Furthermore, ambient air cleaners are equally effective for a wide variety of work applications: metalworking, woodworking, machining, soldering, plastics, ceramics, and automotive paint and body work. And so while being a very versatile product, the ambient air cleaner’s usefulness is optimized by placing within a shop the proper number of units. The calculations for determing that number are simple and straightforward: the cubic feet of shop in question multiplied by the desired number of hourly air changes divided by the air cleaner’s hourly air movement rating. We’ve created a form for the purpose of doing these caluclations in an organzied and sequential manner. We’ve even included an example to demonstrate the logic of the methodology.